John Burgess, master player, is again at the top of his form in this recording. His interpretation of the two piobaireachds will be treated by enthusiasts as archive material, to be savoured and enjoyed again and again. In the light music he is, as always, at his brilliant best, displaying an excellence of technique and a mastery of expression that can serve as a standard for pipers everywhere. 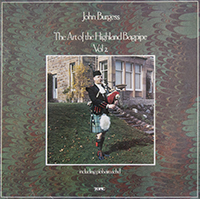 He reveals also, for the first time on any recording, his considerable talent as a composer, his arrangement of the Masonâ€™s Apron is exciting and unexpected and shows yet another facet of this great piperâ€™s talent.